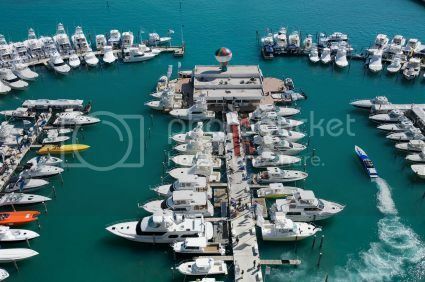 The Miami International Boat Show has been called the “Greatest Boat Show in the World.” The annual event is held every February at venues in downtown Miami and Miami Beach. The current venues include the Miami Beach Convention Center, Miamarina at Bayside, and the Sea Isle Marina and Yachting Center. The Miami Boat Show is produced by the National Marine Manufacturers Association (NMMA), which has a membership of over 1,700 marine accessory and boat manufacturers. NNMA members are responsible for manufacturing over 80 percent of marine products used by United States boaters. The Miami International Boat Show is the largest boat show in Florida. The show features not simply hundreds of boats but thousands of boats. Over 3,000 boats from all over the world appear for the show including yachts, fishing boats, sail boats, speed boats, powerboats, and more. Accompanying the thousands of boats are over 2,000 boat dealers and exhibitors. This boat show is considered the gold standard of boat shows and the best place to preview what is new in the world of boating for the coming year. This event is much more than a show and a presentation of vendors handing out advertising and promotional materials. A variety of hands-on and learning opportunities are also available. Some of the top names in boating hold open seminars, clinics, workshops, and other activities. New this year is Dive & Travel Harbor, featuring diving equipment and personal scuba gear testing in a heated pool. The Big Game Room Sport Fishing Expo is available for those who prize fishing above all other boating activities. Sailing enthusiasts can stop by Strictly Sail at Miami Bayside. Free sailboat rides are offered by Discover Sailing and Latitudes & Attitudes will be around with their annual musical Bash. For convenience, a park and ride station will be set up at American Airlines Arena just north of Bayside. Free shuttle buses will run from the park and ride station to all three venues beginning one hour before opening and until one hour after closing. Parking at American Airlines Arena will cost $10 per day. For those attending the unaffiliated Yacht & Brokerage Show being held on the same dates, a separate free shuttle bus service will also be available between the Miami Beach Convention Center on Collins Avenue and the Sea Isle Marina & Yachting Center from one hour prior to opening to one hour after closing. In addition to the shuttle bus service, water taxi service is being offered for the first time in 2011. Water taxis run each day from 10:00 am to 6:00 pm between American Airlines Arena, Miamarina at Bayside, and Isle Marina & Yachting Center. For those who require mobility assistance, wheelchairs are provided free at the Miami Beach Convention Center. Electric scooters are also available for a $40 rental fee each day. Advance cash reservations are accepted. • Children 15 and under accompanied by a ticketed adult are always free. For further ticketing information and group sales, call 954-441-3231. The Time Bandit is a 30-foot super-vee Phantom offshore racing boat sponsored by the captains of the Time Bandit fishing boat featured on the Deadliest Catch TV show. The boat will be driven by Bob Mazikowski and working as throttleman is Travis Lofland. This is called the best diving and diving destination presentation in the United States. It is located on the first floor of the Convention Center and features all the latest gear and information about the hottest destinations and resorts for diving. Demonstrations are made in a heated pool, and the public can test equipment and take scuba lessons. Another clear plexiglass tank is used for presentations. • Sailing at Strictly Sail – Three levels of sailing and sailing training are available. The first level is for those who have never sailed before and is held daily a 4:00 pm. The second level is for those who have sailed before but are inexperienced. These 90-minute sessions start at 10:30 am daily. The third level is for experienced sailors and 90-minute classes start at 1:00 pm daily. • Coastal Navigation – Learn to navigate using the latest GPS equipment on a 26-foot Andros. Classes are held daily at the Sea Isle Marina & Yachting Center at 12:00 pm, 2:00 pm, and 4:00 pm. • Joystick Docking – Learn how to maneuver and dock vessels with a joystick docking control system at the Sea Isle Marina & Yachting Center daily at 12:00 pm, 2:00 pm, 3:00 pm, and 4:00 pm. • Close-Quarter Boat Handling – Learn advanced docking techniques and close-quarter maneuvering from certified RPBA captains on one of three boats: a 21-foot Bayliner Bowrider, a 23-foot Rinker, or a Mercury Verado.